Now and then THE BEE is a gadfly for things that a local governmental agency would rather we not bring up. TriMet has made it pretty clear that they are a bit short of delighted whenever we bring up one particular issue dealing with public transportation options in the north end of Westmoreland. But if we don't bring it up now and then, chances continue to diminish that anything will ever be done about it! So here we go again. Back in the 1990's, although nobody at TriMet seems to remember it now, a delegation from that agency came to the Board of SMILE – the Sellwood-Westmoreland neighborhood association – to ask that it support higher residential density in the north end of Westmoreland specifically because they were going to build a light rail line down the McLoughlin alignment, and they wanted a lot of apartments to be within walking distance of the new light rail station they were going to put on the north side of McLoughlin at about 18th. They were going to construct an overhead pedestrian bridge at that point to provide access to the south side of McLoughlin in Westmoreland. SMILE agreed to do it, and that became part of the Neighborhood Plan adopted by SMILE in the largest meeting SMILE ever conducted – involving some 600 residents, in the gym at Sellwood Middle School. After much contention, the plan passed by some fifty votes. Shortly after that, the light rail line down McLoughlin went to a public election for funding – and, although Inner Southeast voted for it, areas which already had their own MAX line (which each had voted for) did not want to have to help fund ours, and defeated it. That led to a period of time when TriMet explored the idea of dedicated bus lines on McLoughlin, and even a Willamette River water taxi; but in the end – at all their open houses – the demand was simply and only for light rail, and eventually they promised to resurrect that idea. But when our turn came again, they decided instead to build a light rail line down the I-205 corridor east of 82nd Avenue! They promised that ours would eventually follow, which finally it did. But it didn't follow before TriMet presented a plan that entirely left out that planned station to serve north Westmoreland which is now zoned to encourage apartments there! The problem was that the pedestrian bridge over McLoughlin at S.E. 18th would "cost too much". But, in subsequent open houses, it became clear that there was considerable demand for such a station anyway; and THE BEE noticed on the posted maps that the Reedway Street extension across the Union Pacific railyard still existed, which would be a great alignment for a pedestrian bridge that not only would connect north Westmoreland to a light rail station there, but would also connect the north side of Reed College (where the dorms are) directly to the new light rail station. It would also provide direct access to light rail to much of the Reed neighborhood – and would also allow direct pedestrian and bike access between north Westmoreland and Reed College. If there weren't funds for such a bridge at the start, we pointed out, there was and always has been a signalized crosswalk at S.E. Harold Street which would provide access for north Westmorland to a new MAX station at Reedway, fulfilling the original promise. 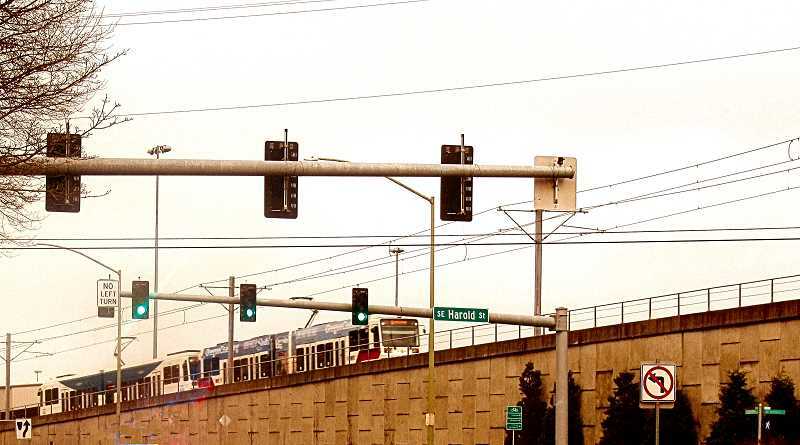 With what appeared to us to be some reluctance, TriMet added a "Harold Street Station" to the planned new MAX line opposite Reedway – but with an asterisk, making it clear it was an option rather than a certainty. However, the Reed neighborhood and Sellwood-Westmoreland neighborhood associations voted their support, and Reed College gave it support as well, as long as it would not displace the Bybee Station, which it did not. As the new line was built, TriMet told SMILE that the new station would not be built at that time. They later said that because of the high grade opposite Reedway, the new station could not be added later, either. When SMILE protested and residents proposed bake sales to raise the money to build the station as the line was built, TriMet reversed itself and said the new station could be added later, after all. 1. Westmoreland used to have frequent direct downtown TriMet bus service (Buses 31, 32, and 33), in addition to the much slower downtown service of Bus 19, which is still required to travel on the Ross Island Bridge (rather than the new transit bridge), and thus which runs very slowly in commute times. And there remains Bus 70, which used to stop near the Broadway Bridge for a fast walk downtown, but now veers east towards N.E. Fremont. 2. The very day that the new MAX line opened (with no north Westmoreland station), it forever cancelled Buses 31, 32, and 33, north of Milwaukie. That ended fast and direct access downtown to and from this increasingly populated part of Westmoreland. Only Bus 19 goes downtown – slowly – now. 3. Because of the lack of the "Harold Street Station", the gap between the Holgate Station and the Bybee Station is the longest stretch in Multnomah County on the entire Orange Line without a station. Potential MAX riders have to hoof it across six lanes of McLoughlin and way up to Holgate, or down past Westmoreland Union Manor to Bybee, in order to catch the train. (Or, says TriMet helpfully, they can always catch Bus 70 to Holgate.) There is a space which could become a commuter parking lot on the northwest corner of Holgate and 17th, but TriMet is keeping it fenced off and is trying to sell it for development. The surprising bottom line is that the new Orange MAX line has resulted in a considerable DECREASE of public transit options for those in north Westmoreland. They repeat statements that they cited originally to avoid building the station, as you'll see. "Few will use it." "The (one-minute) delay of stopping there would discourage Clackamas County riders from using it." "The close proximity to other stations." None of those objections stand up to scrutiny! The real reason is acknowledged: "Land use in the area that does not support the station, and the cost of pedestrian bridges needed to connect the station to the Reed, Eastmoreland and Westmoreland neighborhoods." What specifically they mean about the land use issue is unclear, but it probably is related to the second half of that statement – the cost of the pedestrian/bike bridge from the west side of McLoughlin at Reedway to the top of the MAX line berm and on to the stub of Reedway just south of S.E. 28th in the Reed neighborhood! For some years, supported by the Reed, Sellwood-Westmoreland, and Eastmoreland neighborhood associations, an effort has been in progress by residents of the area to interest the city in itself building that bridge. It would, after all, provide the only pedestrian and bike access between the west side of McLoughlin and the neighborhoods east of the Brooklyn Rail Yard in the long stretch between Holgate and Bybee. But, if the city builds the bridge, will TriMet finally build the Harold Street Station? We detect no real enthusiasm for the idea by TriMet, even if that were to happen. Yet, as traffic problems increase, and as Portland increasingly relies on public transit solutions for future traffic congestion, it is clearly needed. In this situation, north Westmoreland, the Reed neighborhood, and Reed College are increasingly being left on an island with diminished public transportation options, as we in north Westmoreland watch the MAX train zip by…without stopping. It needs to happen. And at the very least, we call on TriMet to update their studies to show the realities of demand, and respond to a need they themselves identified in the 1990's before they even started building MAX here. They could restore Buses 31, 32, and 33 to downtown – or they could put the Harold Street Station back on the table. And until they do address that need, THE BEE will keep its stinger out, to provide gentle jabs to our public transportation agency from time to time on this subject.